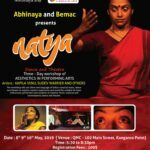 Abhinaya in association with BEMAC presents Abhinaya Festival 2019 on Saturday, May 11 from 4.30pm – 9.30pm at the Queensland Multicultural Centre (QMC). 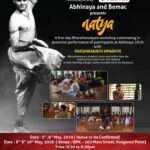 Abhinaya Festival 2019 features the performances of finest quality Indian classical music and dance by the leading exponents. Parshwanath Upadhye, leading Bharathanatyam artist and recipient of Sangeeth Nataka Academy Yuva Puraskar 2017 will present a traditional Bharathanatyam concert. Kumar Gandharva Awardee-2017 Kapila Venu and Sandra Pisharody will present Mohiniyattam concert. Sudev Warrier, who has specialised in the music for dance and disciple of Padmabhushan Dr Balamuralikrishna will lead the live music ensemble accompanied by Brisbane’s own senior musicians and instrumentalists. The festival will also feature performances by Brisbane’s artists and students of the respective forms. Workshops will also take place as part of the festival. Expressions of Interest are now open. For more information or contact the festival go here.